Tech recruitment utilising blockchain, smart contracts, and machine learning to save time and money for companies. 1. Provide companies with the most effective recruitment solution ever conceived. 2. Match talents with their dream job in minutes without any extra work or repetition. We know that recruitment isn't easy, unfortunately most companies on the market today simply cannot afford to hire properly and thus end up making costly hiring mistakes that stymie their growth and progress. 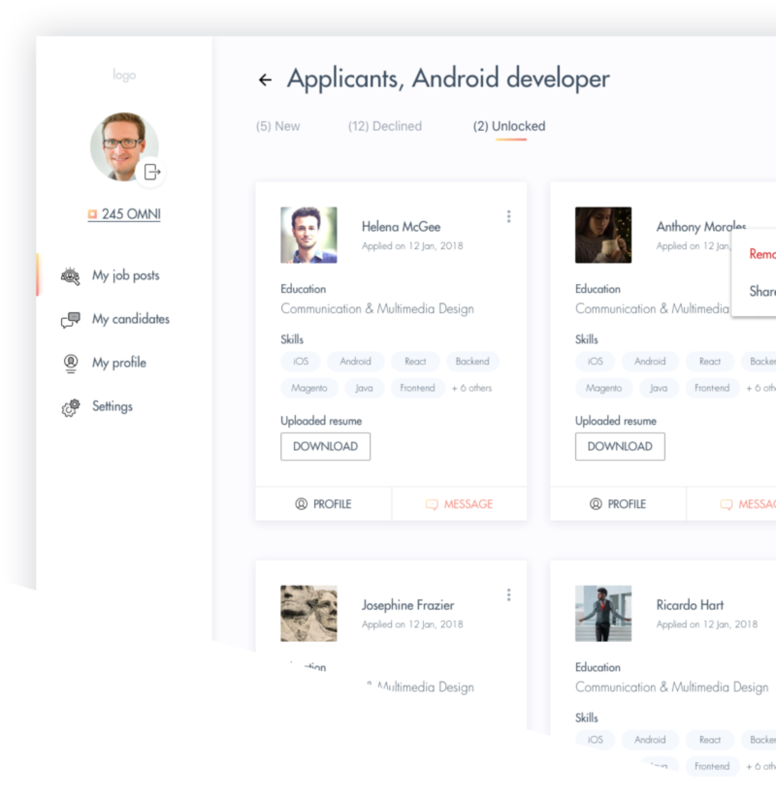 Omnibloc was designed from the ground up to ensure recruitment is accessible and effective for all by making the most intelligent recruitment platform available on the market today. Register your company account and begin hiring the highest-quality candidates available based on your exact needs in minutes at zero upfront cost without any contracts or hidden fees. -They take too long (42 days on average). -They cost too much ($4000 on average). -They do not guarantee candidate quality. -They require too many contracts and other legal agreements. Omnibloc solves all these problems by offering companies with the most intelligent recruitment tools utilising blockchain technology, smart contract programming, and machine learning algorithms. Companies simply register an account with their details, posts a job with our AI assistant to better determine their exact needs, and begins receiving high-quality applicants in minutes. Each applicant they receive is verified by Omnibloc and matched via our machine learning algorithms to ensure compatibility and thus reduce the chances of making a costly hiring mistake.